Your debut full length Tome was released June 1. What does it offer extreme music and how has fan response been? Well, first off, the fan response has been phenomenal. Our existing fans, or as we call them Acolytes, have given us lots of positive feedback and are really enjoying the incantations that are new to them that they may not have heard us play live. Additionally, we are getting new Acolytes daily that are just now hearing about us thanks to the buzz from the album. The buzz has been beyond our expectations, with the album appealing to the metal masses as well as other musicians and critics. As for what Tome offers extreme music … I think it offers the fans a chance to immerse themselves in the world created by our music and mythos and hopefully escape the harshness or blandness of reality for a bit. Our soundscapes are diverse and epic in scale and offer the listener the opportunity to discover new things upon repeat listens. So, if someone just wants something to band their head to, they can do that, but if they want more, there is plenty to discover. Additionally, the mix of doom, death, black and prog metal we have puts us in a space where our sound seems to be fairly unique. You can piece together numerous influences while listening, but I feel like we have our own distinct sound. Is the band formed of musicians who have worked in other band situations beforehand? What elements does each member bring to your style of “epic metal”? Yes, all of us have played in other bands before and each of us brings myriad influences into the band musically. Absalon (guitar) has deep roots in doom and blues. Blind (throat and screams) is heavily influenced by Scandinavian melodic death like Scar Symmetry and Dark Tranquility. Y’takt (bass) is influenced by Rage Against the Machine, Marilyn Manson, etc. BG Scios (drums) brings in some of the more extreme metal influences mixed with a dose of Bill Ward. Hex (new synth and keys player) has very eclectic tastes and roots in prog, as did Sol, our previous keyboardist who played on Tome. As for myself, I think I bring a background of some classic metal and NWOBHM into the band, as well as heavy doses of Iommi, Candlemass and Alice Cooper. So, with every band member a contributing writer, the sound that comes out in the end is definitely an amalgamation. In the end, it just sounds like Summoner’s Circle. How did the band concoct the title “epic metal” and how well does it describe your sound as intended for your supporters? I don’t remember which one of us first jokingly made the comparison of our songs to literary epics due to their length and subject matter. I do remember saying that it was a good fit, even considering today’s slang use of epic something that is huge, awesome or over the top. Big sound, long poetic stories and over the top stage show … it just seemed to fit the bill. I doubt that it’s an original moniker for metal genre because it seems that there are sub-genres on top of sub-genres now, but we feel it fits us well, especially seeing as it’s hard to place us in any single death/doom/black category. How much of a process is it to fuse all the radically different influences you cited together? It’s not very difficult at all. To be quite honest we don’t even think about it when we are writing. It’s just something that falls together organically as we progress. So you would say it’s better for band members to do what comes naturally while working together rather than try to force something out just so they can talk about versatile they are? I would say that’s what works best for us, and that’s what makes sense to me. Other bands may have different formulas they use when writing and arranging. In the end, if what comes out is good, then I suppose the method to get there isn’t so important. I think if the end product feels honest and captures the ear and emotions of the listeners, it all good. Name some bands you know of that are unique without trying to be these days? Oh man, that’s a tough question. I think Opeth is an example of a band that has continued to evolve their sound and grow over the years in such a way that their music remains unique, but the progression of the band feels very natural. It still feels like Opeth no matter what they write - no matter how different the style is. I think it’s this kind of approach that helps bands develop their own signature sound or style. If you’re too busy trying to sound like something or some band in-particular, then it might come off as derivative in the end. There are some fans of extreme metal who think it’s all been done and there is little to no unique music coming out now. Do you think musicians and bands can still find a signature sound that differs from the others? Of course. There are plenty of bands out there that may strive to follow a tried and true formula with their sound. For instance, we live in the Southeast US where bands like Pantera are royalty. There’s still a huge audience for that sound and there are lots of bands in the area write their original music in that style, intentionally or unintentionally. Proven success formula, big influence and lots of fans for that style – it all makes sense why that happens. Subsequently, it makes sense why folks may find lots of extreme music derivative. It would seem to me that as a fan of music, if one found all the new music in their preferred genre to be derivative or repetitive, then it might be time to try listening to other styles of music for a while to expand their musical view, or, work a bit harder to uncover some of the hidden gems still at a local/unsigned level. There are lots of bands out there with very distinct and original sounds. You might have to work a little harder to find them, but they are out there. What do you think of the addition of string instruments, traditional music (from each band’s home country), female vocals and folk influence in metal? Are some bands more proficient in that than others in your view? We all love it, and there are too many bands to count that all do it well. We’ve talked about having actual strings on our next release (not synth strings), as well as a guest female vocalist for a few parts. We’ll see how the writing goes, but it’s something we’d like to incorporate in places for special/specific parts, etc. What would you say to those who still consider extreme metal noise after how much it has progressed and grown? It’s all good. Some folks are just never going to get it. Everyone has their opinions and if metal doesn’t float their boat then I hope they have music in their lives that they love and that elicits the kinds of emotions I feel when I listen to music. Music is a magical thing. Why did Summoner’s Circle decide to name their fans Acolytes? What does the band offer them that differs from other bands, and how receptive have your listeners been? By definition, an acolyte is a person assisting the celebrant in a religious service or procession. It can also mean a follower, or assistant. With every event we play being a Summoning and blood ritual it makes sense that out fans join us in the ceremony and partake of the experience. Any acolyte that offers themselves as sacrifice or partakes in our marking ceremony during our song Become None, will then become a None – a being at one with the Void, tied to and held back by nothing. Our music video for Become None depicts a blood sacrifice and the becoming of a new None. Acolyte or None, our Legions are growing, and our listeners are presented with the opportunity to join us in the world we create and become part of our mythos. A promotional video for Tome, Become None, came out last November. Did making it available for viewing generate a sufficient buzz? Absolutely. We felt it was important to get something out there to introduce us to the public before rolling out the entire album. Since we are a theatrical act, we wanted to put a video together that musically and visually captured the essence of who we are and what fans might expect when they see us live. We feel the video does a great job of that. We are now putting together ideas for our next video, which we hope to shoot in the fall. One of the challenges of being a theatrical act is you always have to strive to one up yourself. So, we’re busy trying to come up with a story and concept that will do that. Describe the concept and theatrics of the Become None video. Was it produced independently of did you work with outside parties? The initial concept for the video was the brainchild of Blind. As for how it was put together, Blind and I created the storyboard and shot list, determining what shots were going to be over different sections of music. The sound engineer/producer of our album, Yanic Bercier from WaveTransform Studios, hooked us up with a filmmaker from Norway, Thomas Mortveit, that his band, Gone in April, was working with. Thomas came to states and we shot the video over a two-day span. Thomas is extremely creative and gave us lots of great ideas on how he could take the shots we outlined and make them even better. The end product turned out better than we could have imagined. We owe a great deal of thanks to both Yanic and Thomas for working with us and believing in the vision we have musically and theatrically. We are hoping we will get to work with Thomas again on the next video. Is there a storyline in the Become None video? In what ways does it reflect the song’s lyrics? Yes, there’s a definite storyline. A young girl visits her recently departed father’s estate, says her own special goodbyes and then begins to go through his things. It’s obvious that the girl and her father were not close. As she begins to box up his things she uncovers some hidden truths about her father when she digs up an old book and ritual dagger. Happenstance (or perhaps Fate) would have it that she accidentally cuts herself on the dagger and spills her blood onto the tome. From there, the Summoners and wretched ghouls are called forth from the darkness and proceed to scare/chase/herd the girl down into the basement where she in entranced by Blind and called forth into the circle to be sacrificed and reborn as a None. The song’s lyrics speak of learning the savage truth of light, giving up earthly doubt, emptying your soul and accepting the void and absence of anything that is a higher power designed to control or enslave you. Reborn with new dark knowledge, and with the assistance of The Six, what is next for the girl? How many bands has Thomas worked with, and how did his experience help the band as you were working together? Man, I don’t really know for sure. He has a lot of experience, and I know that while he was here in the States he worked with several other bands from our area in just a few weeks’ time. His ability to know what the shot is going to look like before he shoots it is uncanny and speaks to his experience level. We took lots of direction from him and he made numerous suggestions and tweaks to our proposed shot list that helped make the video into what it is. He is also very fun, laid back and has a sense of excitement and joy about what he is doing while he works. It was infectious and made a grueling shooting schedule much less stressful and much more enjoyable. In what ways did Thomas’ approach to filming videos bring the band’s vision to the surface? Well, he has exceptional editing and post production skills. His ability to select the right filter, or color saturation, or what have you, really makes the end product have polish and completes the story. The visuals match the tone of the music, not just in shot composition, but in how the scene finally looks - the mood. His cutting and editing choices follow suit - short shot vs long shot, etc. The dude is just good and we consider ourselves very lucky. What ideas do you have in mind for your next planned promotional video? How will it stand out from your previous video? It really depends on which song we decide to choose. We are thinking the next video will be for one of the harder-hitting tracks on the album like Worm Tunnel or Balrog General, both of which are crowd favorites. As for how it will stand out… well, it will definitely have its own unique story. That’s how we roll. I’m not sure we will ever have a music video that is solely performance. Will you be hiring Thomas to work on the new video? If so, has he presented any ideas to you yet? We certainly intend to, although we have not discussed any ideas with him. Describe Tome to the readers, and how it expands on what is represented in your videos and onstage performances. Tome is broken up into three books – The Book of Earth, The Book of the Void and The Book of Fire. The incantations that comprise each book have a feel about them that makes their placement into that book seem natural. The earthier sounding compositions are in The Book of Earth, etc. We try to make each of our songs into a story with a matching soundscape that feeds and grows our Mythos. We are very conscious of the importance our lyrics and music play in the overall band image. The image feeds the music, the music feeds the image. It’s the whole serpent swallowing its own tail – a cyclical kind of thing. From giant flesh eating worms, legions of wretched undead warriors summoned to do our bidding, and binding a minotaur to our will, to capturing the fire and fury of Balrog General to assist us in our quests, overthrowing the Overseer of a heinous construct and freeing his slaves and a tale about quest through the dark catacombs of a ruined temple … there is a great deal of fantasy and Lovecraftian cosmic-style horror in our work that we bring with us to the stage to live out the stories for our Acolytes. Finally, we bring the sacrifice depicted in our Become None video to the stage at every performance with a live human sacrifice and blood ritual. Always blood, always void, the light distorts truth and only in darkness is all revealed as it truly is. Who in the band devised the concept of Tome and how long did it take to develop it? Our previous keyboard player, Sol, came up with the idea of having separate books based on the music. I came up with the name Tome thinking about something that would hold multiple books or volumes therein. Being summoners, the idea of a magic tome of incantations with different chapters made sense. Everyone liked the idea so we rolled with it. To me, it just makes the final recording seem more like a finished product. As to how long it took… the concept itself didn’t take that long to develop. It was relatively quick as compared to the writing and recording process. The final artwork and packaging took about a month to finalize once we had all the photography in place. How helpful was Sol’s input into the concept of the album? Was Sol okay with the band developing it after you parted company? Sol contributed greatly to the album’s concept, writing and recording and they are still good friends with us. Because Sol recorded all the keyboard parts and did additional vocals on the album, its release provides all of us with a bit more closure to the situation than night have occurred otherwise had Sol left mid-project. We wish Sol a well journey, wherever it may lead. Does the band have a new keyboard player at this point? How well has he adapted the songs you composed before he joined? We welcomed Hex into the band officially a month or so ago. He was filling in on live shows for Sol for a month or two prior to that when the album was in the mixing phase. He’s a very talented musician, playing several instruments in addition to keys, and picked up all the material quickly. He’s now starting to add his own flare to some parts as he grows more comfortable with everything, but he’s doing so without changing the feel of the songs. Sol was helpful and showed Hex some of the trickier parts, so it’s been a smooth transition. How many bands was Hex in before he joined Summoner’s Circle? In what ways does his ability to play more than one instrument help the band? Hex was actively playing in like five or six other area bands when he started filling in with us, and still gigs with some of them as time allows - just local stuff and all kinds of different styles. He likes to stay busy. His ability to play different instruments certainly helps him when learning new material because he can just watch me play the guitar parts and pretty much learn the material that way. It also offers us some flexibility moving forward if we want to bring a third guitar part in live, or an acoustic, he’ll be able to handle stuff like that. As we continue writing new material, it will open up new options for us. Does any of Hex’s other bands have anything out? Are those releases available for streaming? A few of the other bands he’s played and recorded in are The Lucky Stripes (pop/rock), Jaystorm Project (funk/hiphop), Shaun Abbott (country). How many chapters did Tome develop into once the band began working on the concept? How much of a process was it to interpret the concept through the writing process? We finished up with the three chapters mentioned a little earlier – Book of Earth, Book of the Void and Book of Fire. Honestly, everything just fell into place very naturally for us in that regard and the compositions themselves fueled the naming of the books. A couple of the longer songs like Temple of Suffering and Legion took longer for everyone to master, but that’s to be expected with more parts and variations, etc. The key is just being patient while you are showing the riffs or parts to the others while they are learning and creating their own parts to go with the riffs. I’m fortunate to be in a band with such talented and driven musicians who take their craft seriously. So, overall, I’d say it was an involved but fun process for me. Where does Lovecraftian inspiration come into Tome? Which of Lovecraft’s published works remain relevant today? Our first release, First Summoning, was very cosmic horror and Lovecraft inspired and the songs were, in my opinion, darker in tone. Tome is a bit more on the fantasy/blood magic side of the Summoner spectrum, but a track like Worm Tunnel still has a bit of the Lovecraft vibe to it. You can expect our next release to delve back into the dark world of cosmic horror a bit more. We are working on an overall theme for it already and it’s trending that way. It will be interesting to see where we’ll end up with it. Much of Lovecraft’s work was fueled by his intense xenophobia. His fear of the unknown and unexplainable from other cultures, as well as their people, was represented by the unknown and unexplainable horrors he wrote about. Cultists and madmen from remote, primitive parts of the globe worshipping unknown gods and threatening established and civilized culture. An invasion of alien entities like the Mi-Go spreading their horror.… That kind of thing. I can definitely see a correlation to events going on in the world today, with fear of other cultures and religions growing ever more prevalent, and blind nationalism on the rise in many countries. Fear of the unknown and unexplainable will always haunt us as a species, and that is why this kind of dark horror remains so powerful. A threat you cannot comprehend that brings chaos and madness to the world you know - it strikes against your primal survival instincts. For that reason alone, Lovecraft’s work will always remain relevant. In what ways can your songs be considered reflections of the blind nationalism that has increased over the last few years? Other than the aspect of writing about the horror of what lurks unknown in shadows, nothing. One of the many reasons Lovecraft’s writings remain relevant today is due to that, but we intend our music to be an escape for the listener. We hope it takes them away from the drudgery or worries of every day existence and lets them visit our realm of horror and fantasy to become part of our world for a while. We are purposefully apolitical and avoid writing about current earthly events because people are inundated with that via social media and the 24-hour news cycle. Was First Summoning a demo or an EP, or what sort of a release was it? Are copies still available? First Summoning was a four track EP we released in October of 2015 in concurrence with our very first show. We wanted to come out of the gate with music for the fans to purchase. It is still available for purchase through all the usual digital channels, and is also on Spotify, Bandcamp, etc. Additionally, we still sell physical copies at shows. Was your debut performance meant to be a release party of sorts for First Summoning. How well was the show received? Yes, it was. The show went about as good as a debut show can go. We had the venue filled and the crowd loved the music and stage show. It was an indication for us that people were hungry again for theatrics with their metal and that our concept was one that would work. Describe the four songs you recorded for the EP and how they were written and composed. How many copies do you usually sell at each show? The first piece, Ex Obscurum, is an intro with voice over telling of our beginnings. It sets the mood for what is to follow and provides the listener with some background about the lore of The Six. Further Into Dis follows. It is a slow, doomy number, and is the first song we finished writing. Musically and lyrically this song is still a perfect introduction to what Summoner’s Circle is about. Classic doomy tri-tones give way to an up tempo 12-bar blues riff under the solo, plunging back into atonal wailing and doom -- The mixing of styles right out of the gate. One of my favorite things about this song is watching the live audience mosh to 12-bar blues… something I never thought I’d see in my life. The Purifying Light Of Apophis is thematically one of my favorite songs. It is written from the perspective of an eternally old comet whose end mission is to crash into Earth and wipe it clean with cosmic fire. Apophis tells the story of loneliness, isolation and things it has witnessed as it has wandered the cosmos all building up to its great end. Musically a very atmospheric into gives way to a driving song that mirrors the wandering and ultimate great purpose of the comet. The final song is Leviathan, Lord Of The Labyrinth. If we had a theme song, this would be it. It’s a crowd favorite, inspired by Lovecraft and the Hellraiser movies. It has a simple yet crushing main riff, crawling odd tempo parts, a huge hooky chorus and a very atmospheric clean section. It’s a big song, and the first real epic piece we wrote. In that way, it’s a very important song for us because it opened the door (or portal maybe) for the material that follows on Tome. It’s also my favorite song to play live. The writing of these songs, like Tome, was very organic. Minus the intro piece, the songs were written in the order that appear on the EP, so you can see the evolution as we continued to expand our vision musically, becoming more ambitious with each piece we completed. We certainly sell copies of it at every show and are on our third pressing of it. If you’ve read The Hellbound Heart, the book Hellraiser was based on, how would you say it compares to the movies? I have not read it, though it’s one I really ought to read. I’m currently binge reading The Expanse series, which is the book series (now up to seven books) that the TV show was made from. Great books if you dig sci-fi. Do you see connections between Lovecraft’s writings and the Hellraiser movies? Where exactly do the two connect? The most obvious connection, in my mind, is the shared theme that there is knowledge or there are things out there that if we were to truly get to understand, or experience them, will lead to madness or death. This stuff lies well outside of our realm of our existence and understanding and isn’t meant for our earthly fragile minds and bodies. Those whose pursuits push them too far pay the price. On what streaming and purchase outlets does First Summoning get the most active response? In general, we’ve always done very well with sales through Bandcamp. It’s a great site for folks who enjoy looking for new or more underground bands. Who did the band approach for cover art and packaging for Tome? Being that it was your debut recording, what kind of an impression did you want to make? We did all the art and photography ourselves with a booklet design/layout assist from my significant other. Blind is a talented photographer and I am a graphic designer, so we worked together on the concept and artwork. Since it is our debut full-length release we wanted to come out with a polished product that had the same epic vibe as the music. The weathered and bloodied book cover was a natural for the digi-pak cover and was inspired by the scene in the Become None video where the blood drips on the discovered magical tome. The booklet feel was inspired by our lore and the unknown realm of shadows the Summoners walk through. We wanted it to be something that fans would spend time with reading the lyrics, identifying with band members, and becoming part of our world while playing the music. How long have you and Blind been doing graphic design and photography? Are you satisfied with the work you two did for the cover? Many, many years for me as a professional graphic designer and art director. Same for Blind as a photographer. We are extremely happy with all the artwork and packaging for Tome. The cover, the booklet and the CD art itself all fit the aesthetic we are going for. That being said, there are many talented artists out there and we’d certainly be open to collaboration on future projects. For Tome, we chose to keep it all in house, so to speak. 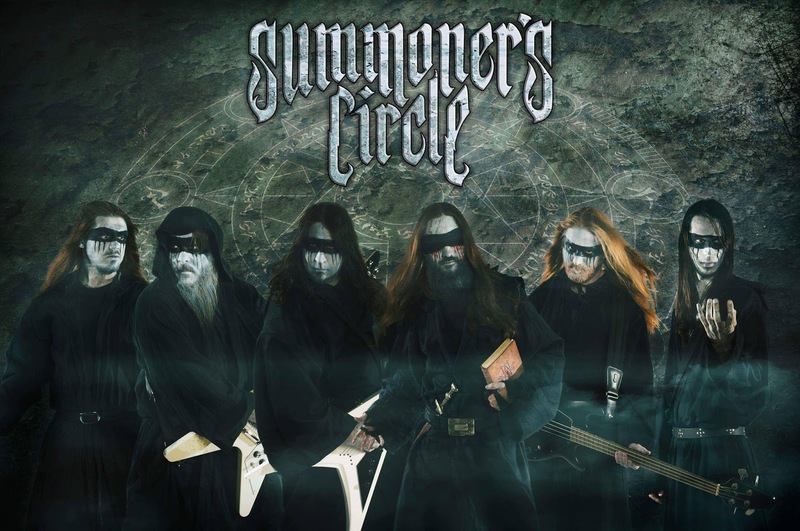 Has Blind photographed for other bands before Summoner’s Circle? If so, which bands did he lend his talents to and for which albums? He’s done photo work for a few area bands which were used for promotional shots, etc. He’s also done a good deal of fashion photography and event/concert photography. I know he did band photos for the local band Downslave, which they used on their last release. Have you had bands approach you to design fliers or album covers? Or if it happened, would you take them up on it? I’ve done event flyers and website design for bands and promoters in the past, but over the last few years I’ve mostly just focused on my own band’s efforts and I save the design work for the day gig. I don’t really market myself as a designer in the music community because I have an abundance of freelance work available to me through other channels that keeps me plenty busy. My first love and is my music. My design work is a means to and end and allows me to pursue my musical career. What is some of the freelance work you have lined up at present? Just some user experience and interface design for a couple of companies. Nothing music related. Back to The Expanse, is that series speaking to you enough to make you consider basing a concept on it for the band? It’s probably a little too straight sci-fi for a direct concept for an album, but there are themes that persist and unanswered questions in the series (without giving too much away for those reading the books or watching the show) that could certainly be used. Genetic experiments involving the proto-molecule and the use of an alien technology that is not truly understood both open the imagination up to all manner of cosmic horror related truths to be discovered. Is there anything you have watched or read recently that you would consider for the concept of a future recording? Nothing in particular. As I mentioned earlier, we have a broad concept established that we are building on, but it is still a work in progress. It’s going to be a totally separate concept from Tome, and I see it dealing with madness, cosmic horror and truths never meant to be understood by mortals. What unholiness will The Six summon and how will our lore build as we travel the cosmos in search of blood and knowledge? We shall see. Is there anything more about the concept of the next album you can share in advance? How much work is needed for it? We have a long way to go with it still. We have a few songs already in the works, but none completed yet. I feel like the overarching concept that will tie each of the songs together is established though, and I’m pretty excited about that. What do you most want the band to accomplish musically and aesthetically? Is this goal attainable as it stands now? We’d like to continue to grow as a band, writing new songs that evolve with us in addition to touring and playing festivals to grow our audience. I’d like to continue to make the stage show even more of a spectacle, which should be achievable as we progress. At this point its about growing the fan base and maximizing opportunities. A big short-term goal for us is to get to Europe and/or South America soon because we have a good number of fans in those places that are requesting us. Thanks so much for the interview, and for the support.